Whether they would most enjoy shopping at Barnes & Noble, Lowes, or The Golf Shop; or would prefer relaxing for a meal at TGI Fridays or a massage from Spa.com, you can select the perfect gift card to give your customer, friend, or family member. You can even give them a gift card that allows them to donate to a charity of their choice. Simply create your card from our selection of elegant card designs or use a photo for the card front, write your note, sign you name and choose from our wide selection of gift cards to include. You can purchase the gift card with a credit card or pay through PayPal and then send your card by mail. The gift card is printed on the inside cover of the card along with redemption instructions. You can also send your thank you card with a gift card by email if you don’t have their mailing address. 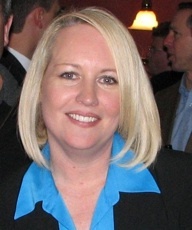 As a District Manager for software sales to car dealers, Cyndy is definitely on the go. Time is limited, but she has chosen to make an investment in sending customized thank you notes to her customers. At a previous job, she sent handwritten notes on corporate printed cards. When she changed jobs recently, those cards were not available so she chose ThankYouPro. Cyndy was hesitant at first to move away from handwritten notes, but she now believes that the combination of ThankYouPro’s cursive fonts and the ability to totally customize each note is a winning alternative. She believes that her customers realize that she is making the same effort to say thanks. Besides, she says her handwriting is hard to read, so it’s actually better. She finds that it is a time-saver as well. Instead of waiting to do several cards in her office, she does her thank you’s while waiting for the next appointment. Another time saver is the ability to use her saved cards as a template for the next card, complete with her customized cover, but personalized for each recipient. Is there a pay-off? She says definitely yes. While hard to actually quantify the dividends for thank you notes, she says the cards stay on people’s desk for 4-5 months. Her reception on follow up visits is warmer, friendlier and people remember her name. Her bottom line: If you’re looking for a way to differentiate yourself from your competitors, real thank you cards are a great way to do it. Not many people make the effort, using email as a less impactful method. One idea she passes along, try using Cardmunch, a free app that captures business card info and automatically loads it into your iPhone contact database. No more typing in addresses! One way to ensure customer loyalty is to thank them for their business. And we have a great opportunity with a holiday focused on gratitude – Thanksgiving Day. Thanksgiving reflects our national history without any religious or political ties, making it an excellent time to remember customers and clients. 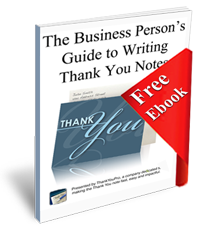 Writing a card or note thanking them for their business is a surprise with powerful impact. Don’t even think about emailing your gratitude! It should reach them by Monday, November 20 (or even Friday, November 17), as the week of Thanksgiving is a popular time to take vacation. Consultant Lynn Gaernter-Johnston in her Business Writing blog offers these samples to use as templates. Thank you for being our valued customers. We are grateful for the pleasure of serving you and meeting your printing needs. We wish you a beautiful Thanksgiving and a joyous year’s end. On behalf of all of us at XYZ Company, I wish you a very happy Thanksgiving. In this time of Thanksgiving, I must express my thanks to you. 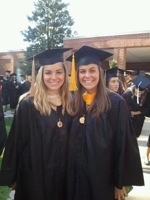 Working with you over the past two years has been an amazing opportunity for me. I appreciate your high standards, consistent focus, and fine sense of humor. Thank you, Carlos, for the pleasure of continuing to work with you. I wish you a wonderful Thanksgiving filled with all good things. We saw the enclosed new book on landscaping by ____ [author], and we immediately thought of you. Please enjoy it with our thanks. So the event is over, the gifts have been opened, we all oohed and ahhed, and now it’s time to do thank you notes. Why is it that it seems like such a painful task? Mothers everywhere browbeat their kids into this painful task. In the past, I have hated having to go back through my lists, buying just the right set of cards, and sitting down to handwrite all those notes – even though I love the people to whom I am sending them. Well, the pain is gone! With my cool new tool, thank you notes are a snap – and even fun. It’s so fast! I can use the same basic thank you and customize it for the specific gift. And probably the best part is that I can use a photo of the event as my card cover, ensuring that the gift giver gets something really special from me. So graduates, don’t despair over thank you notes. Enjoy the event and the gifts knowing that ThankYouPro makes the ending as fun as the rest of it! Interview experts will tell you that it is critical to send a thank you note after every interview. Interview experts will also tell you that few jobseekers actually do it. Beyond the professionalism factor, a thank you note will make you stand out. In sales, the common wisdom is that it takes multiple sales calls, or “impressions”, to close the sale. When you are interviewing, you are selling yourself. 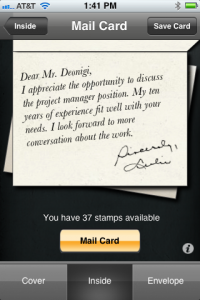 A thank you note is another sales call – another chance to make a good impression. Employers know that if you appreciate an opportunity, you will appreciate the job. You can use the note to reiterate your interest in the job, reinforce your strengths and add anything you may have forgotten. You should send thank you notes to every person involved in the interview- interviewers, managers, and even administrative assistants who were especially helpful. DO NOT send group thank you’s. Personalize the note by addressing it directly to the person you want to thank. • Send it immediately – a thank you note should be sent before the hiring decision has been made, so it is best to mail it as soon as possible after the interview. • Send paper cards. Hiring managers get tons of email so you will stand out. The difference in impact could land you the job. • Keep it short. The hiring process is long and difficult and hiring managers will not take the time to read a multiple page letter. • Be professional – err on the side of formality, no cute cards, use business closings such as Best regards. See The chapter on writing Thank You notes. Are Thank You notes just a nice thing to do? When we get very busy serving our customers and filling our funnels, we find that even “thank you note believers” will put sending out notes on the bottom of their to do list. The value of a Thank You note is a hard thing to quantify, unlike getting an order filled on time or landing a new customer. So it stands to reason that if something has to be left for another time, it would be the thank you. Unfortunately, study after study shows that when you demonstrate gratitude to your customers, they are warmer on follow up visits, spend more with you and become talking billboards for your products and services. And customer loyalty is quantifiable – it costs 5 times as much to get a new customer as it does to keep a current customer. Saying thank you to vendors results in better service, delivering on time and keeping your cash flowing. Employees who are appreciated are more productive and stay longer. Thank you’s do pay big dividends wherever they are given. At the end of the day, it is because all these transactions are based on relationships – human to human, even in this highly digital age. And one of the most basic human needs is acknowledgement. Acknowledgement is the action of expressing or displaying gratitude or appreciation for something. Think about any relationship you have that isn’t working as well as you would like and the chances are that an abundance of acknowledgement or appreciation is missing. Casual thanks are nice, but are missing the “effort” factor. Acknowledgement in the form of a simple thank you note is absolute magic. But we still have the problem of time to do it. While there are digital solutions, e.g. email and automated follow up letters, they do not always convey the sincerity that we want. Fast and easy most often is interpreted as fast and easy, i.e. limited impact. We want speed and convenience and we need the personal impact. Thankfully, there is new technology that gives us both the convenience and the personal touch. ThankYouPro is an iPhone app that allows us to create and mail a real paper note (not a postcard!) in less than a minute. The paper note is mailed with a first class stamp almost immediately. This sophisticated app is totally customizable, provides a variety of handwriting fonts, and best of all, lets you sign your card right on the phone. The result is a handwritten look in short expressions of gratitude, perfect for sales call and interview followups, gifts and even friendly catch-ups. This class of thank you notes definitely helps to end the email vs paper note dilemma, providing an even higher level of convenience than email while making it a personal experience for the receiver. Check out ThankYouPro at the app store for the most sophisticated and convenient app for thank you notes.